A P90 design in a standard Telecaster Bridge size. 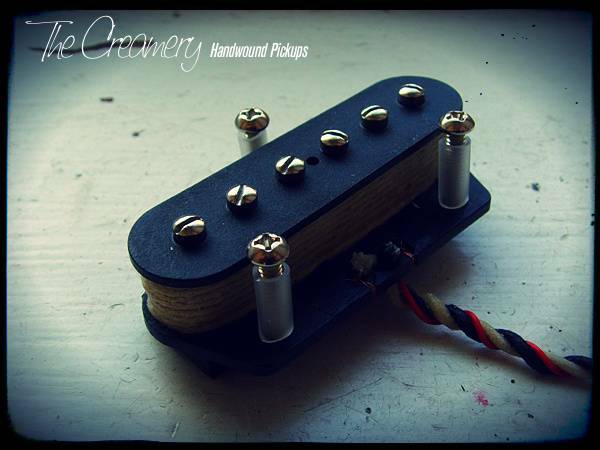 The Creamery Telecaster sized P90 'Mid-Range' pickup houses two custom sized Alnico 5 magnets, wider steel screws and a short, fat 43AWG coil. Fatter, grittier, dirtier single-coil voice still with clarity, presence & definition - JUts a darker, rounder, fuller than the Tele-90 'Treble' version. Get the grittier P90 sound in a standard Telecaster Bridge size. The geometry of the standard Tele Bridge Pickup size as opposed to a standard P90 means there will always be a slight difference in sound between the two pickups as the coil will be slightly narrower and therefore taller to achieve an approximate output level - Its for this reason I don't call it a "true" P90 although I've voiced this pickup to have more of that darker, grittier P90 edge. A higher output, fat single-coil sound in a standard Tele Bridge sized pickup. I've had two designs of magnet custom manufactured for these pickups, a standard option Alnico 5 for a more mellower take and a double-thickness Alnico 5 for a stronger, more attacking, punchier sound. Please Note: The Tele-90 bridge is about 2mm taller with the standard Alnico 5 Magnets and about 5mm taller than a standard Tele Bridge pickup with the Double-Thickness Alnico 5 magnets and whilst it will fit many cavities, if you have a shallow bridge cavity, please check. The total height of the pickup with pole screws is 18mm or 21mm whereas a standard Tele bridge is around 17-18mm. You'll need a minimum cavity space of at least about 14mm to fit the pickup.